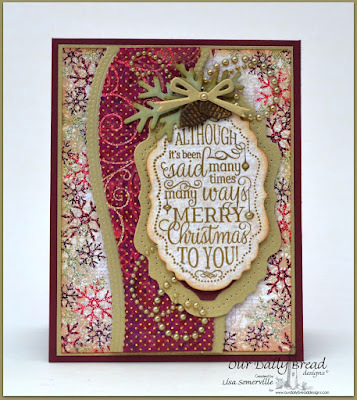 Designs by Lisa Somerville: Home for the Holidays - Our Daily Bread Designs October New Release Blog Hop! 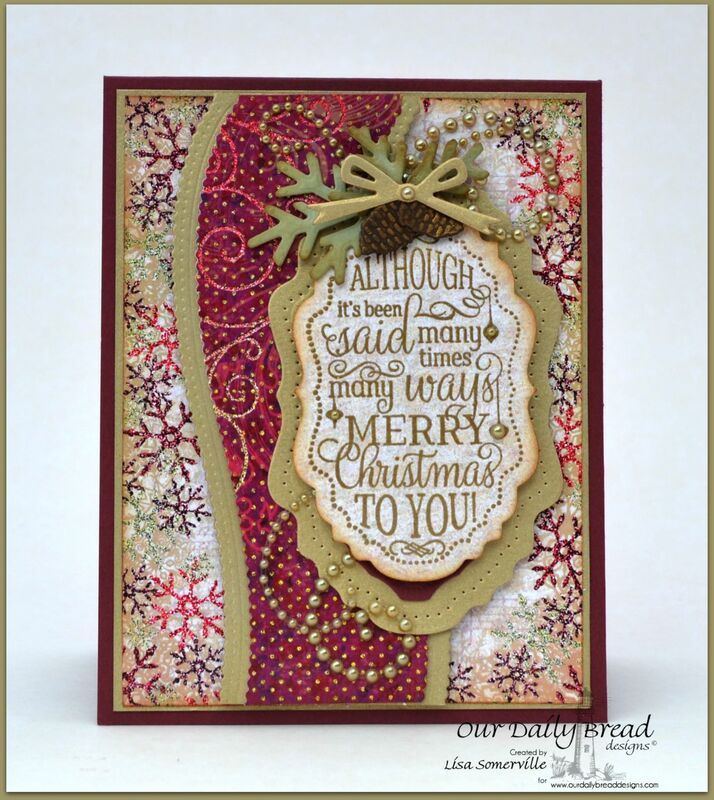 Home for the Holidays - Our Daily Bread Designs October New Release Blog Hop! Welcome to the New Release post and Blog Hop showcasing projects from Our Daily Bread Designs October Release! You can see all of the October Releases here. Continue reading below to find out how you can win one of three $25 Gift Certificates to the ODBD Store good towards the purchase of ODBD stamps. I'm sharing two cards using the Christmas Tunes stamp set, Delightful Decorations and Tree Trimming Trio Dies along with the beautiful new Christmas 2015 Paper Pad Collection. Both of my cards also use some older ODBD Custom Dies, please see the details below for a complete list of supplies used. 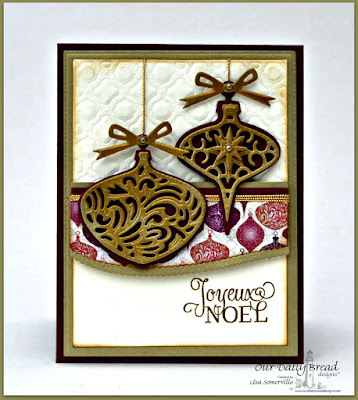 To add dimension and shimmer to the beautiful die cut ornaments, I added Gold Metallic Rub Ons. The sentiment is Gold Embossed, the border panels were die cut with the Leafy Edged Borders die set. For this card, I Gold Embossed the sentiment from Christmas Tunes onto a scrap piece of the pattern paper, then die cut using the Vintage Labels die set, layering onto a few other die cut panels. To embellish, I die cut papers using the Fancy Foliage and Circle Ornaments die set, adding Metallic Rub Ons to the pinecones. To further embellish, I added a few Crystal Gems. Three randomly selected winners will each receive a $25 gift certificate to Our Daily Bread Designs, good towards the purchase of ODBD stamps found in the "ODBD stamps column" of the ODBD Website, just for commenting on the Design Team cards! You have until October 2, 2015 at 9:00 p.m. EDT to leave your comments. The Winners will be posted October 3rd, on Our Daily Bread Designs Blog, so be sure to check back there to see if you won! * Silke * America * Loretta * Robin C.
Both of your cards are super gorgeous!! I love the clever ways you find to show off the papers and dies! Fabulous job on both!! HUGS!! Love them both Lisa! The top one is my fave with the contrast of the light bg, the pretty papers, and the ornaments in such rich tones! Beautiful! Very beautiful! Love seeing your work each month. Beautiful cards. So looking forward to enjoying the new release. Thank you for putting out stamps/dies that glorify our Lord! Beautiful cards! Thanks for sharing with us! Such rich elegance! I would have to be a bit partial to the French! So rich and beautiful Lisa!! I love the added texture on the first and your use of the border dies and your layout on the second. Lovely cards! I really like the gold on black of the first card, and the curvy layout of the second! Your cards are very nice and I especially liked how you did the background on the 2nd card! The new backgound papers are lovely! The new ornaments are so pretty! Love your cards! So rich and elegant! Wonderful job! Both cards are so vibrant and beautiful! I would love to receive one of these cards. Very elegant--I like the metallic rub ons on the pinecones. ur cards are both super pretty!! Both cards are great. I love the dies, stamps and paper! Both the card are very pretty and so full of holiday cheer. Love the pattern paper. both cards are lovely. the second one has a vintage look. love the textures and colors...thanks for sharing. Your cards are so rich and beautiful! Beautiful samples, Lisa! The gold on both makes them so elegant! Great use of dry embossing and heat embossing with the gold on the first card. Love the matching paper and the open space. Very elegant. The second card will have me singing this carol all day long. Love the gold, the snowflake paper and the pearls you added. Another beautiful card. Beautiful cards!! The ornament die cut is awesome!! Love it!! The new release is wonderful!! These papers are so elegant and you've used them beautifully on both samples, Lisa! Love the deep purple and gold on your first card and the curvy panel and framed sentiment on the second! Stunning work, my friend! Hugs! Love both of your cards Lisa! The simple elegance of the first and using gold always add that special touch. Your second card has that vintage look that I love, especially with the addition of the pearls! Great designs! love both cards! very pretty! Wow! Love the use of the patten paper. Such wonderful ideas. Thanks so much!! Both of these are so pretty, Lisa! Love the framing & quilted top on the first & the lengthwise bands are wonderful on the second. Beautiful Christmas cards Lisa! Great use of the new items!